Can Smart Economics Turn Us Into Better Parents? You will not be surprised to learn that parents matter. You might be surprised to learn how much – or, perhaps, to learn that social science has managed to attach precise figures to something as ineffable as a good parent’s value. A 2011 study estimated that parenting (e.g. maternal sensitivity, reading, extracurricular activities, setting expectations) explains 40 percent of the cognitive gap between children at age four -- more than any other factor. With adopted children, researchers found parental education was a better indicator of school performance and behavior than family income or neighborhood wealth. But there is a persistent and widening parenting gap in America. 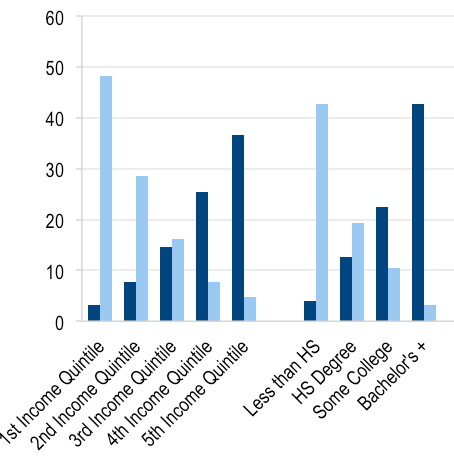 Rich college-educated families score well on parent quality tests, according to a new paper by Brookings scholars Richard Reeves and Kimberly Howard. But poor, less-educated, and often-single parents are falling short, spending less (and less-quality) time with their kids. Just 3 percent of parents in the bottom quintile – and just three percent of single moms and dads -- scored among the best parents in the time-use research collected by Reeves and Howard. Breaking the vicious cycle requires some sort of intervention – but to understand the parent gap, we first have to understand the marriage gap. The best parents are married, educated, older, rich, and white. But what drives what? Among affluent parents, the overwhelming majority of black (85 percent) and Hispanic (88 percent) parents qualified as average or above. In the last 50 years, single parents have more than tripled as a share of the country's families. They now account for nearly one-in-three households. Practically all of the growth is happening among poor, less-educated, minorities. 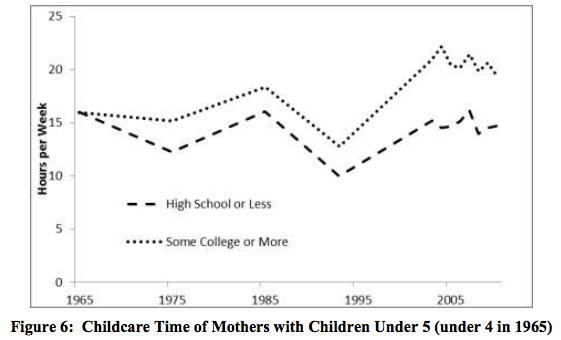 Researchers have found that poor single mothers adopt an entirely different approach to childrearing -- one that, in the face of economic hardship, values survival more than achievement. Being poor and starved for time and resources affects the tools parents have to raise their children -- but also, it affects how they see the world in which they're raising their child. 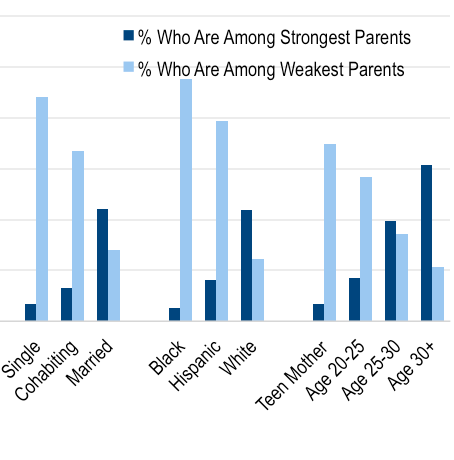 The ironic tragedy of single-parenthood is that the parents most likely to be able to support a child alone are richer parents who are the least likely to be single moms or dads. Indeed, high-income parents talk to their children for three hours more per week than low-income parents. They spend four-and-a-half hours more in "stimulating" places, such as parks or churches, for their infants and toddlers. Richer, college-educated parents don't just spend more on their children; they spend a greater share of their income and time on their children, especially within the top 20 percent of households. Good parenting isn't an inchoate thing to researchers. It comes from measurable behavior. Reading time. Playtime. Time, basically. The value of a good parent can be measured in hours, and, as you can see, it often is. But if we can’t give lower-income families more time – either because they have to work longer hours or because there is only one parent in the house responsible for both earning money and raising children – how do we begin to believe that we can make better parents? There are two basic ways to improve the lot of children, according to Reeves and Howard. The first tries to make bad parents less relevant. The second tries to make bad parents less bad. You won’t find many education activists yelling “make bad parents irrelevant!” but that is, in a way, a key purpose of public education. Beyond state-funded education, programs like KIPP, Race to the Top, the NCLB, and Head Start all try to overcome the intrinsic handicaps of growing up in a disadvantaged neighborhood or troubled family. But there are drawbacks to this form of intervention. Education is still funded at the local level, where richer counties spend more per student, and poorer counties often fall behind. A recent study found that Head Start, a famous early childhood program, didn't improve academic performance through 3rd grade. Americans seem less comfortable with direct efforts to make bad parents better, such as sending professionals into houses to teach parenting skills. Families, after all, are considered the most private institution there is. But Reeves and Howard focus on precisely these house visits as an answer to the parent gap. They take a particularly close look at the Home Instruction for Parents of Preschool Youngsters (HIPPY) program, which trains parents to teach their child to read through biweekly home visits and group meetings. A randomly-controlled experiment of HIPPY in New York found significantly improved reading scores and classroom behavior. "Our modeling predicts that if all low-income families were enrolled in HIPPY, three percent more low-income children would graduate from high school and six percent fewer would become teen parents," they write. Perhaps “three percent” sounds like painfully incremental progress when measured against the gaping difference between low- and upper-income children. But consider the payout. The per-child cost of HIPPY is about $3,500. The lifetime bonus from graduating high school is $260,000. "A cost-benefit analysis of HIPPY by Steve Aos at the Washington State Institute for Public Policy found a return of $1.80 for every dollar invested, with the improvement in test scores resulting in a present-valued benefit of $2,120 for the program participant," Reeves and Howard write. 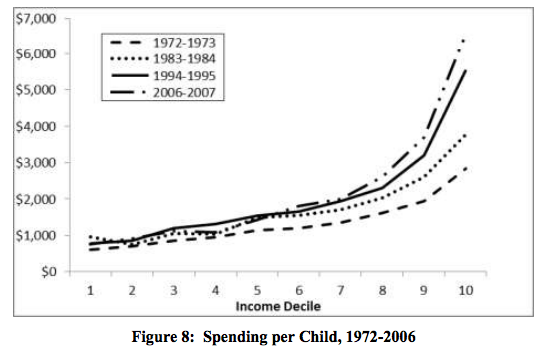 The bad news is that parents influence children far more than social programs can influence parents -- for now. Programs like HIPPY alone won't reverse the powerful cycle of poverty – where poorer kids are less likely to graduate from high school, less likely to have a child with a committed spouse, and more likely to raise a child facing the same challenges, or worse, that they did. Asking the government to support policies that send workers into a private homes to teach parenting skills smacks of Big Brother -- or, perhaps, Big Mother. But do we still have the luxury of rejecting solutions simply because they feel too direct?